Could a new Origin promotion mean that Valve and EA are getting back together, or is EA just getting rid of Valve's stuff? You can get Valve games on Origin, but perhaps not in the way you might expect. 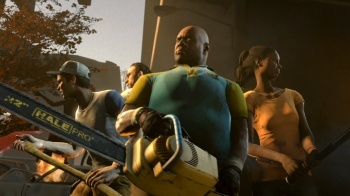 As part of a promotion on the service, people can pick up the Game of the Year edition of Left 4 Dead, Left 4 Dead 2, and CounterStrike: Source. But they're not the digitial copies you'd get on Steam, they're physical copies that EA will mail to you. EA and Valve has recently had something of a falling out over Steam, with EA games like Dragon Age 2 and Crysis 2 disappearing from the service. Some are suggesting that this promotion points towards a reconciliation between the two companies. However, EA has been Valve's distributor for boxed copies of its games for a while now, so it's not as if this is some new deal the two companies have brokered recently. Ultimately, this move might mean nothing other than EA has some copies of CS:S that it can't shift, and wants to free up the space in its warehouses. Hopefully though, it does mark the end of the dispute between the two, if only to give people more choice when shopping for games.